If you are missing one or more teeth, you fully understand how this common dental problem can negatively affect how you enjoy life. At Cosmetic & Family Dentistry in Weatherford, TX, Dr. Deborah Romack and Dr. Garrett Mulkey offer a variety of restorative dental options to help you reclaim your healthy smile, including the placement and restoration of dental implants. Missing teeth affect your daily life in a variety of ways. When your dentition is incomplete, your remaining teeth begin to shift and move in order to take the place of those that are missing. Your jaw bone begins to deteriorate without anything to stimulate it. This can lead to additional tooth loss, a problem that directly impacts your ability to eat and speak properly. 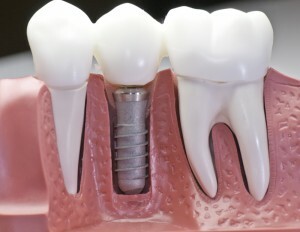 Dental implants effectively replace the entire tooth, including the root. A small post of biocompatible titanium is first placed within your gum tissue and jaw, serving as a new anchor for an aesthetically customized crown. When the crown is placed and affixed to this implanted post, your restoration is complete. The resulting “new tooth” looks, feels, and functions just like the rest of your bite, allowing you once again to chew normally, speak clearly, and smile with complete confidence. At Cosmetic & Family Dentistry in Weatherford, TX, our doctors perform both steps of the dental implant procedure right here under one convenient, welcoming roof. Whether you have been missing one or more teeth for an extended period of time and are interested in your restorative options or you’d simply like to learn more about dental implants, we are here to help. Contact our office today to schedule your consultation with Dr. Romack and Dr. Mulkey. Our family-friendly practice serves patients from throughout Weatherford, Aledo, Springtown, Millsap, Mineral Wells, Brock, and beyond.